Understanding the carbon exposure of smart beta strategies is important for market participants who are already implementing factor strategies and wish to incorporate carbon risk into the investment process. In a previous blog, our analysis showed that factors such as low volatility and value may be predisposed to higher carbon emissions because of their sector compositions. The low volatility factor in particular stood out, as it generates the highest total in emissions—three times more than the S&P 500 Enhanced Value Index, which ranked as second highest (see Exhibit 1). The S&P 500 Low Volatility Index, as of June 30, 2017, had 17 utility companies that generated over 60% of its direct carbon emissions. This finding of low volatility indices having a high carbon emission bias presents solutions from the index provider perspective to incorporate a carbon efficiency component to low volatility indices. However, it may be helpful to analyze the S&P 500 Low Volatility Index’s carbon emission history in order to assess whether the high carbon emission is a persistent attribute throughout its history. Emissions are typically measured by mass of carbon dioxide equivalent (CO2e), whereby the “equivalent” is a proxy applied to greenhouse gases other than carbon dioxide and reflects their relative environmental impact. The units of reference are in kilotons of CO2e. 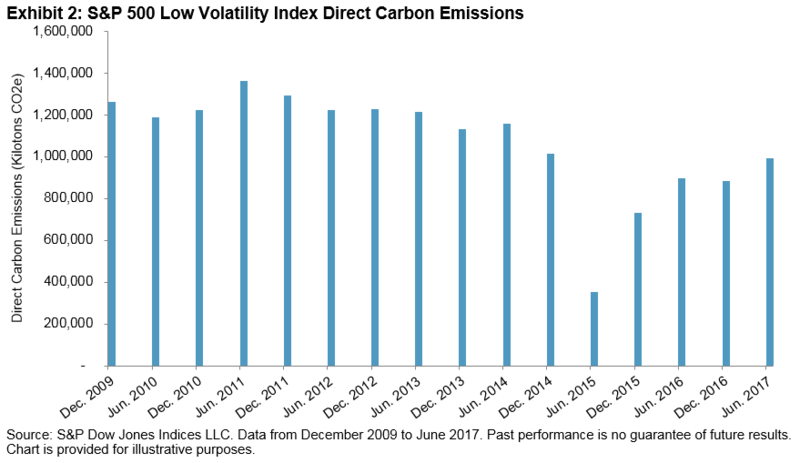 Exhibit 2 shows the total direct emissions for the S&P 500 Low Volatility Index on a semiannual basis from December 2009 through June 2017, and it should be noted that there have been fluctuations in the level of carbon emissions. The S&P 500 Low Volatility Index is designed to measure the performance of 100 least volatile securities, with volatility represented by the standard deviation of price changes over the trailing 252 trading days. The index has shown to have dynamic sector composition depending upon market environments. 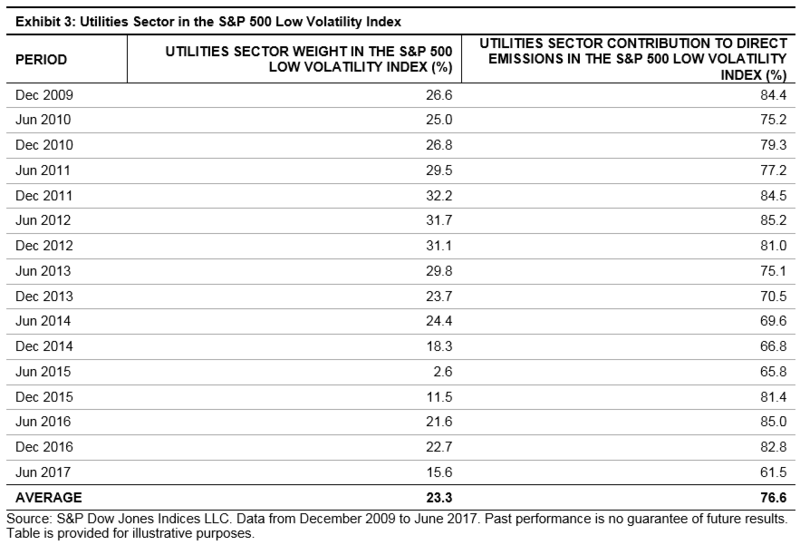 For instance, the utilities sector’s weighting in the S&P 500 Low Volatility Index has averaged 23% from December 2009 through June 2017 with a high of 32% and a low of 3% (see Exhibit 3). Given sectoral shifts, the potential exists for large swings in absolute carbon emissions data (see Exhibit 2). Yet, the contribution to carbon emissions from the utilities sector appears to remain consistently high, averaging 77% since 2009 (see Exhibit 3). The primary objective of low volatility strategies is to reduce realized portfolio volatility and therefore these strategies have a tendency to favor defensive sectors such as utilities. Low volatility indices have been shown to reduce volatility in the range of 25-30%. Adding a carbon efficient overlay onto the low volatility factor indices requires a careful consideration of the potential tradeoffs, as the exposure to the low volatility factor or the average volatility reduction level may be compromised in any approach that targets the utilities sector in particular. For low volatility indices, blindly removing carbon intensive utilities securities could be counterproductive to the primary investment objective of the strategy. As such, more complex portfolio construction techniques such as having an additional quantitative process or an optimization may be necessary to ensure that carbon exposure is effectively minimized while maintaining the desired level of exposure to the factor and the risk reduction abilities. Emissions data is sourced from Trucost, which provides data on both direct and first tier indirect emissions on a company-by-company basis; if companies do not report or otherwise make such figures available, Trucost estimates the emissions of each company using a proprietary model. Direct emissions, as the name suggests, encompasses emissions of CO2e produced directly by the entity, whereas indirect emissions are those that arise from the entity’s suppliers of materials and equipment, utilities such as electricity, and business travel. The inclusion of indirect emissions is not always preferable, especially in an index, as this may result in double counting. For example, if a utility company as well as one of its customers is included in the same index, the emissions of the latter would be counted twice. Brzenk, Phillip & Soe, Aye. “Inside Low Volatility Indices,” S&P Dow Jones Indices (2017).